This comprehensive book showcases the advertising legacy of over two hundred New England breweries, featuring a multitude of exquisite lithographs, trays, signs of all types, cans, bottles, foam scrapers, tap knobs, and other items produced during the last 100+ years. 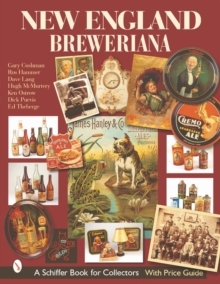 A foreword by noted breweriana author Will Anderson starts off this beautifully illustrated book, while the text provides background information about company history as well as the items presented. Dimensions, dates, and values are provided in the captions. Among the wonderful array of companies included are Cremo, Largay, Wehle, Frank Jones, Eldredge, Haffenreffer, Hampden, Van Nostrand, Narragansett, and Hanley. Breweriana and advertising buffs alike will delight in the colorful memorabilia from brewers of the past who once fiercely competed for market dominance.